I'm here late tonight, but I've remembered all day. Dylan should have celebrated his 19th birthday today with those who love him. I've prayed for extra peace and comfort for them on this special day. Happy Birthday in heaven, Dylan! You are never forgotten. Mark Redwine, the Vallecito man accused of killing his son, made a brief court appearance Friday morning for a status conference. He is suspected of killing his 13-year-old son, Dylan Redwine, in November 2012. A grand jury issued an indictment in 2017 accusing him of second-degree murder and child abuse resulting in death. He faces 16 to 48 years in prison if convicted on either count. Redwine, 56, wore an orange jail-issued jumpsuit at his first appearance in court in 120 days. He sat next to his public defenders, Justin Bogan and John Moran, and did not speak. Dylan’s mother, Elaine Hall, and Dylan’s older brother, Cory Redwine, sat behind the prosecutor on the left side of the courtroom gallery. Redwine’s defense team asked the court for more time to examine police reports and other documents in the case. Sixth Judicial District Attorney Christian Champagne argued for the case to move forward. Judge Jeffrey Wilson sided with prosecutors and scheduled Redwine for an arraignment on June 29. Redwine is expected to enter a plea at the hearing. You don't hear Redwine saying much these days. His days of giberash and rhetorical stupidity are over. No more remarks to further injure the mother, brother, stepdad of the victim here. Let's remember one simple fact. Dylan Redwine had nobody to stand beside him, speak for him, protect him from the man that I believed killed him. Yes, lets be sure that Mr. Redwine gets his fair trial. After that he will be nothing more than a convicted thug. Had he truly loved his son he would of ended this a long time ago. If he loved his son he could of simply accepted the consequences and did what he could from prison to empower other would be thug parents with knowledge. Knowledge is power and it frees all from ignorance and naievity. A consequence that would of prevented his self absorbed narcisisstic malignancy from robbing his son of a life that he was entitled too. Killing a child is simply as evil as it gets. He deserves to rot in prison once he is found guilty of killing his son. That said, if he cared for his son then he should help prevent other would be fathers from acting with such malice. Liked the video and found the comments interesting too. Not sure what to think about the Delphi information, but wouldn't that be something?!!! The story of a killer? We know it has been quiet on the page for a bit without many updates. Mark Redwine has an arraignment hearing on June 29th in which he is to enter his plea of "Guilty" or "Not Guilty". We have no reason at this time to believe he will say anything other than "Not Guilty" although, there are over 14,000 pages of evidence and discovery that states otherwise. Please keep Elaine and family in your thoughts and prayers. June is always a tough month, every year. We are about a week away from the 5 year date that we found some of Dylan's remains. June is always a big month in regard to this case, it always has been. Also, PLEASE keep the people of Durango and surrounding areas in your prayers, with the raging fire just outside of town that is consuming so much forest. Praying for all the Firefighters battling this blaze as well. THANK YOU ALL FOR YOUR SUPPORT!! It means more to Elaine and family than anyone could ever know. Elaine Hatfield Hall Makes me sad still to this day that my 13 year old son has a page that so many faithful warriors follow. Makes me sad that my sweet husband has to make posts such as this one. But every single one of you shows me how bright the darkness can be. I appreciate, respect, admire, and cherish all of you who have never given up on Dylan and have shared and followed his young life. We do have some big dates ahead of us. But it it nothing like it was when we were searching for dylan. Now it is pure and simple justice for him. We all live our lives and try to move on as we should. What else are we supposed to do? But for all of you who have lost, you know, moving on is the only way to honor those who you have lost. I may be silent. I may seem far away but I am here. Through all my family that shares their stories about me and all the friends/warriors that re always here. They often speak for me when I am speechless. Above all, Dylan was sweet, kind, forgiving, handsome, funny, and he loved. Deeply. Let’s all remember how to love that deeply. Thank you all for your devotion and dedication to Dylan and to us. Sweet prayers to all of you for I know we all have our heartaches. Kevin is the reporter that has been there every step of the way. Much respect for his dedication to Dylan and this family, regardless of which newsroom he's working out of. Mark Redwine will appear in court Friday morning for his arraignment. He plead either ‘guilty’ or ‘not guilty’ in the murder of his son, Dylan. I’ve been covering this case since day 1 back in 2012 and will be in court covering this important story for you folks. — in Bayfield, Colorado. DURANGO, Colo. -- Mark Redwine, the man accused of killing his son Dylan Redwine in southwest Colorado 5 1/2 years ago, pleaded not guilty in a La Plata County courtroom on Friday. The plea was entered on his behalf by one of his attorneys. A trial will begin Nov. 26 and is expected to last four weeks. Mark Redwine has been in jail for nearly a year after a grand jury issued an indictment in the case. He was arrested in Bellingham, Washington, and brought back to Colorado in August. Dylan Redwine, who was 13 at the time, was last seen at his father’s home in Vallecito, near Durango, on Nov. 19, 2012. Investigators discovered part of his remains on Middle Mountain. Mark Redwine remains locked up in the La Plata County jail charged with second-degree murder and child abuse resulting in death. He has been held on a $750,000 bond. Redwine has maintained his innocence over the years. Since his arrest, Redwine's attorneys have been going over more than 1,000 pieces of evidence placed against their client. Redwine will now go on trial and given the judge's past statements, he doesn't want to wait on when it will begin. This article has different dates than were announced at the arraignment. During the arraignment the judge said motions hearing was set for Oct 10th, pretrial Nov 19th, and four week trial beginning Nov 26th. During a court hearing Friday morning, Mark Redwine pleaded not guilty to charges related to his son's death and asked for a jury trial. 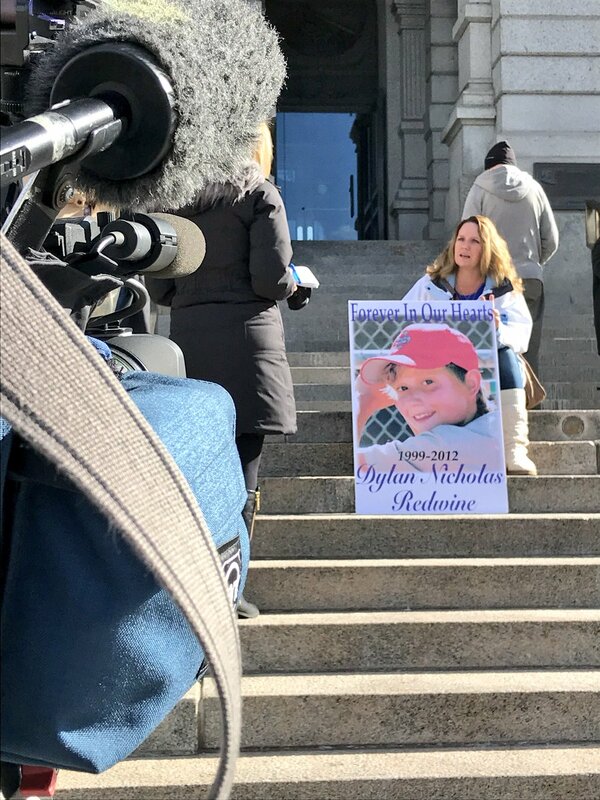 KUSA - Mark Redwine, the father of Dylan Redwine, pleaded not guilty during a court hearing Friday morning on charges related to the 2012 death of his son. Redwine requested a jury trial. Sixth Judicial District Chief Judge Jeffrey Wilson set a trial for Redwine from November 11 through December 21, a news release said. A motions hearing was set for October 11-13. He is suspected of killing his son in November 2012. The teen's scattered remains were found in both 2013 and 2015. Redwine, a long-haul trucker, was arrested in Washington state in July 2017 just two days after a grand jury handed down an indictment for second-degree murder. Cristen Baird wears her memories of the dead wrapped around her right wrist — brightly colored silicone bands belying their meaning — stacked 5 inches high on her forearm. They carry the names of some of those she has loved and lost. Two names appear repeatedly — Devin Scott and Dylan Redwine, only two of the friends the 19-year-old has lost to suicide, shootings, illness or accident in the past six years. Adolescence for Baird has proved not to be the carefree years she anticipated but a minefield of funerals, memorials and candlelight vigils. There have been 116 children 17 or younger whose unexpected deaths have been investigated by the El Paso County Coroner’s Office since 2015. Fifteen were homicides, 39 died in various accidents (which could include anything from accidental asphyxia to car crashes), and 44 died by suicide. The remaining 18 deaths were ruled natural, undetermined or have causes still pending. More than half of those youths were between the ages of 13 and 17. Baird called Dylan Redwine “one of my closest best friends” and sometimes her boyfriend after he moved in across the street in 2012. All the neighborhood kids hung out together, but he and Baird were especially close. When Redwine was required by a court order to visit his father near Durango for Thanksgiving that year, the teens promised to message each other through Facebook or texting until he was back. Redwine was reported missing two days later. Redwine’s remains were found that June. The death went unsolved until last summer when authorities arrested Dylan’s father, Mark Redwine, on suspicion of murder. Mark Redwine pleaded not guilty to the charge June 29 and is next scheduled for a pretrial hearing in November. Champagne declined to comment about the nature of the photographs on Wednesday. Prosecutors filed several motions late last month, some routine, others tailored to the unique circumstances of the Redwine case. One motion seeks to introduce statements Dylan made to family and friends prior to his death. For example, Dylan’s older brother, Cory Redwine, could testify that Dylan requested his brother send him the compromising photos so he could confront Mark Redwine with them during a visit, the motion says. “Dylan Redwine’s statements that he had seen the photographs and previously planned to use them to get back at his father during an argument ties in directly to the motive for the murder, because this was a documented trigger of violence for Mark Redwine,”said the prosecution’s motion. Another motion filed by prosecutors seeks to allow the jury to view the locations on Middle Mountain where Dylan’s remains were found. Redwine is next scheduled to appear in court on Oct. 10 for a motions hearing, where a judge is expected to hear arguments and possibly rule on some of the motions filed by prosecutors and defense lawyers. The home where many believe Mark Redwine allegedly murdered his own son, Dylan Redwine, was sold today to Ditech Mortgage for $151,000 in a foreclosure auction. The home had been for sale by owner for over a year, but the sign in front of the home gave a phone number in Arizona that had been disconnected. Page created in 2.201 seconds with 20 queries.